McSpaghetti Box - Love Ko' To = "I Love This"
This isn't the first time I've had Spaghetti at McDonald's, as McSpaghetti used to be a regular menu item in Indonesia (it's since been discontinued), and also since I tried it before I started writing this blog I didn't get a proper review of it. 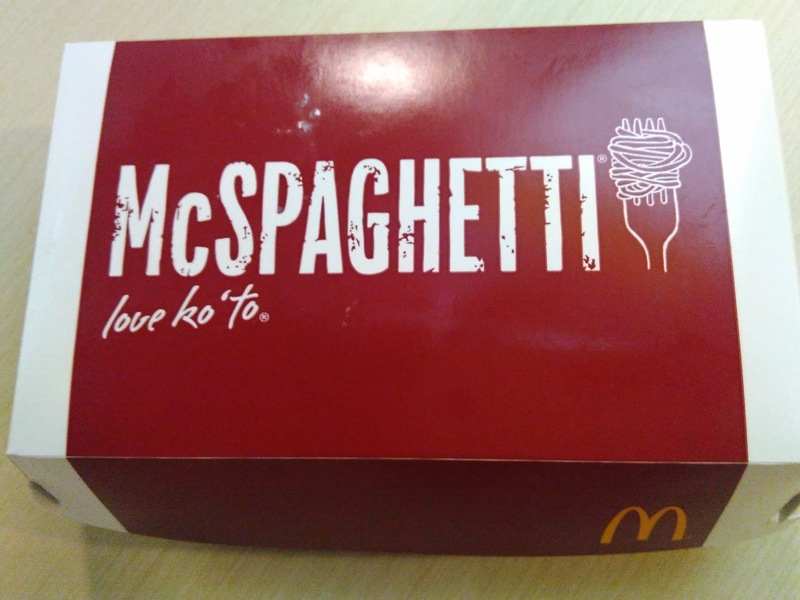 In The Philippines, McSpaghetti is certainly not supposed to be a meal, as it's sold on their equivalent of the value menu together with small hamburgers, sundaes and Apple Pies, and as expected the serving size is a bit on the small side and is just enough not to be insulting, and be a decent side together with a full meal. 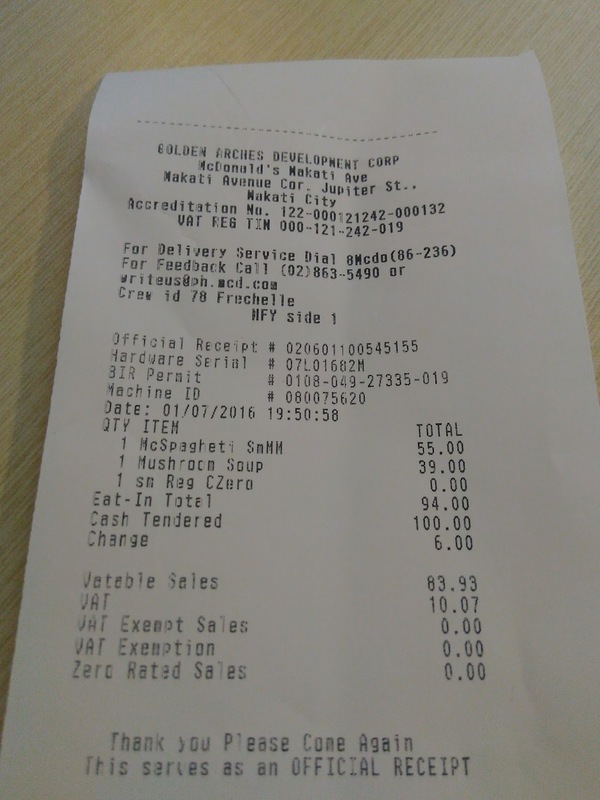 The pricing was also a bit strange as it was 55PHP, or $1.18 together with a small drink, but only 50PHP (a 10 cent discount) if you wanted it without a drink. 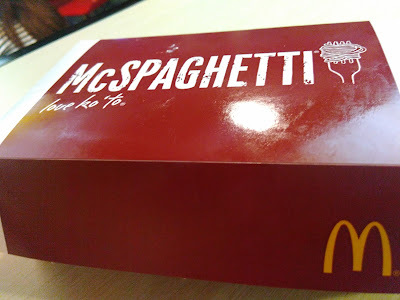 The spaghetti itself tasted a lot better than I expected going in. 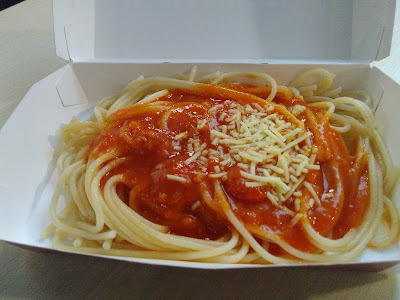 First of all, the noodles were cooked surprisingly al dente which I'm not sure if is the firmness most people in The Philippines expect to be served, or if I just ended up with an "undercooked" portion, but the firm noodles were perfect for me. I was also pleasantly surprised by both the tomato sauce, and the quality of both the cheese served on top, as well as the small slices of sausages mixed throughout the sauce. 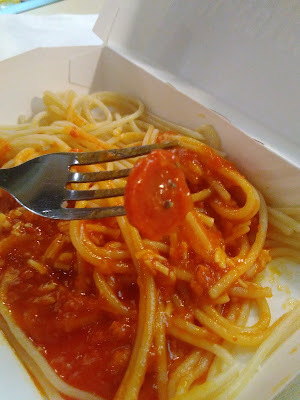 The sauce tasted less like a cheap canned "tomato sauce" and more like a, well, more expensive canned "pasta sauce". It was not only flavourful, but there were both hints of herbs and spices cooked in the sauce and it wasn't just cafeteria grade tomato paste. I have a feeling the sauguage pieces came pre-mixed with the sauce rather than being directly from McDonald's as this type of sausage isn't served in any other dish on the menu and it wouldn't make sense they only cook it for this value menu item. 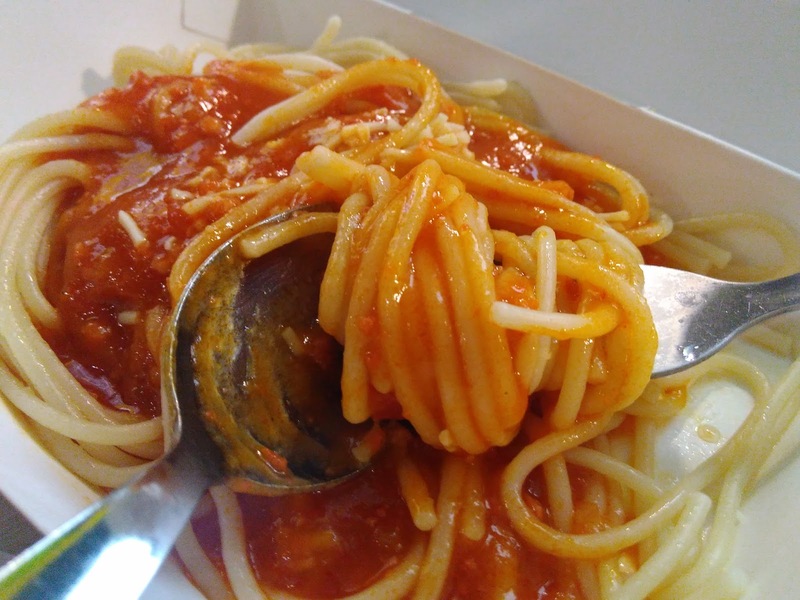 On the other hand, the cheese on top was actual grated white cheese, which as far as I could tell is only used for this spaghetti as well. The cheese was firmer and wasn't just sliced thin processed burger cheese. The only thing which was a bit disappointing was since the sauce and the sausage had so much flavour, the cheese was a bit drowned out as there wasn't really that much sprinkled on top. One other point which stood out to me and I feel the need to mention was the lack of provided plastic cutlery. You were expected to use steel knives and forks which are provided to eat the fried chicken and rice with. I despise eating with plastic cutlery and this was a very nice surprise, as most countries would have stuck with plastic. This is one of those dishes that just hits all the right points, it's unique, and it tasted great. 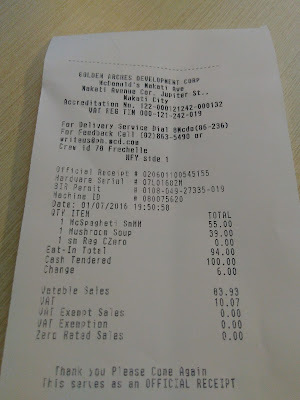 Absolutely no complaints, and as long as you go in expecting you are not going to get a full meal for $1, is definitely worth a try if you are ever in The Philippines. 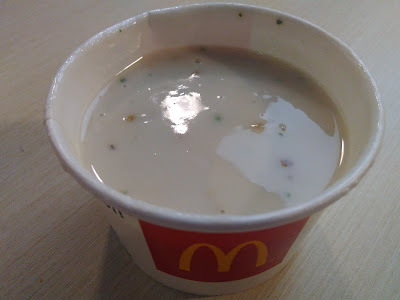 Since I was visiting Manila for work, The Wife wasn't with me, but I did drag a colleague in and since he's vegetarian, he opted to try the other promotional item on the menu - Mushroom Cream Soup, which I was absolutely NOT going to try due to my hatred of anything containing mushrooms. 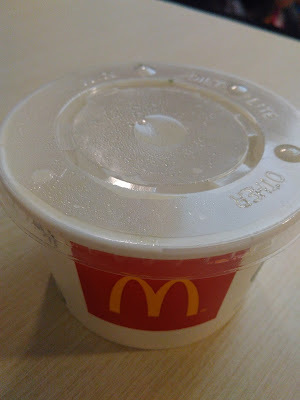 He said it wasn't anything special, but not bad and for 39PHP ($0.80) for a decent size cup he didn't regret his purchase. Soups used to be pretty popular at McDonald's in Asia, but over the last few years I'm only ever running into Mushroom variants.